Summary: In this play-within-a-play, a renowned local theater is doing a completely ridiculous version of Shakespeare's Romeo and Juliet, set on the moon with the Capulets as aliens, the Montagues as humans, and the Friar as a robot, complete with stunt casting (for those non-Trekkie's like myself, Kate Mulgrew played Captain Janeway on Star Trek: Voyager). Five audience members give us their varying opinions and experiences with the play - a critic, a Star Trek fangirl, an understudy, a professor, and man who's attending the play with a woman who is not his wife. Highlights: This is by far the best of the four shows I saw on my first day at the Fringe. 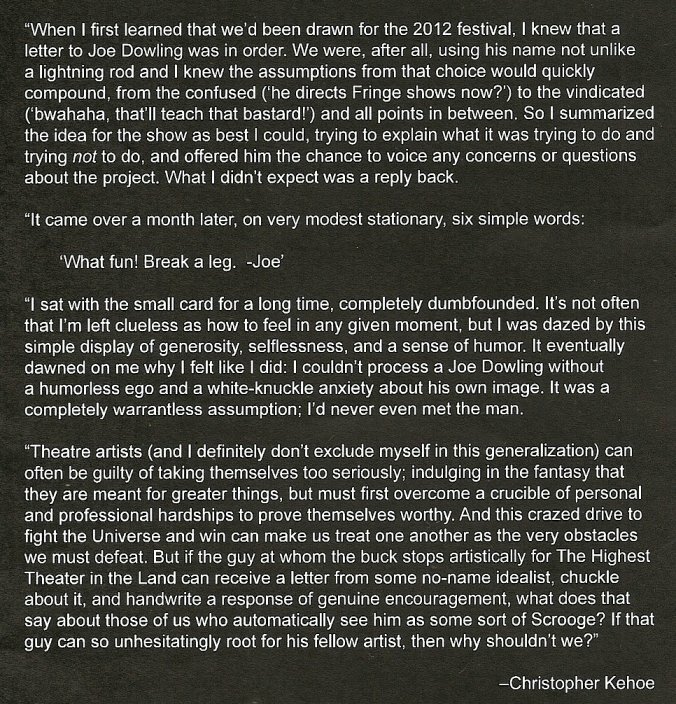 First, the brilliant writing by Christopher Kehoe (who's also hilarious as the pretentious theater critic), in which he very successfully weaves together certain pivotal scenes from Romeo and Juliet with the commentators critiques. He also uses the actors' real names and backgrounds as fodder for the satire (e.g., Alex Brightwell really did recently graduate from the U of M/Guthrie BFA program, Max Wojtanowicz really did appear in the Children's Theater's "Ivey-Award-winning" production of Romeo and Juliet). 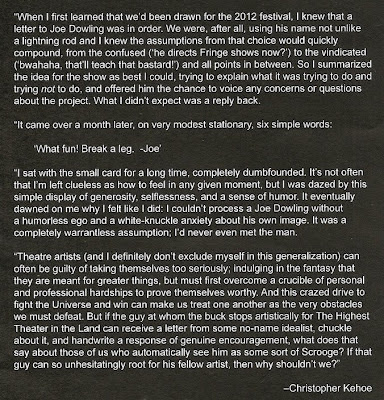 This play pokes fun at just about everything about this sort of big budget spectacle theater, but in a good-hearted way (see the lovely note below about the real Joe Dowling, Artistic Director of the Guthrie Theater). It also illustrates that everyone's experience with theater, or any art form, is different, depending on what we bring to the theater that day. Whether it's "I have to pee," or our education and past experiences, or the person we're sitting next to, it all affects what we get out of the show. What is seen as crap and a waste of time to most of the audience turns out to be, for one man, what "saved my life." And that's the beauty of art. I have to mention the cast that is all-around fantastic (even the robot! ), from the play-within-a-play actors who manage to give such convincing, if slightly over-the-top, performances of this classic play seemingly oblivious to the craziness going on around them that I almost wish I could see the entire fictional production, to the five outsiders who lets us see the play through their eyes, especially Dawn Brodey as the professor who lectures her students about the obvious (to her) misogyny of the piece. This is the second play produced by The Peanut Butter Factory (a producing company, not a theater company) and directed by Natalie Novaceck that I've loved (see also Gruesome Playground Injuries), and it makes me excited to see what they'll do next. Tip: If you go to see this show (and you should), you might want to consider buying tickets in advance. I went to the first performance and it was almost sold out. This show clearly had a lot of pre-show buzz, which is only going to increase as people see it.